There haven’t been many bad days for Kettering Town this season but tonight’s (Tuesday) clash at Latimer Park provides a harsh reminder of one of them. The Poppies take on Dorchester Town as they chase a fourth win in a row in the Evo-Stik South League Premier as the battle for supremacy within the play-off places continues. Kettering suffered a 4-1 defeat in the reverse fixture at Dorchester back in November and produced a performance that resulted in a “deep moment” in the dressing-room afterwards, according to boss Marcus Law. The Poppies manager is now hoping his team can settle the score while remembering how well they have responded to their setbacks during the campaign. “There was a deep moment in the dressing-room afterwards and it wasn’t so much a rollicking, more of some real thoughts on why it happened. The next three games look set to play a big part in deciding who finishes where in the upper reaches of the table. 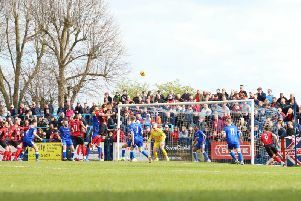 After tonight’s clash, the Poppies host third-placed Weymouth on Saturday before a blockbuster Easter weekend is rounded off by a trip to second-placed King’s Lynn Town on Monday afternoon. “I have set the boys a bit of a challenge in terms of a winning run and we are more than capable of doing that,” Law added.